You have a great product or service, but now your business success lies in your marketing. Content should be the heart of your marketing strategy. Through it, you’ll be able to educate and introduce your audience to new ideas, generate interest into a topic, or establish validation of a problem that businesses should be concerned about solving. Your content should be thought-provoking, inspire change, teach, and provide actionable, next-step recommendations. Content is most valuable as part of a multi-step campaign, and our Self-Assessments are designed to fit into multiple stages within your campaign. 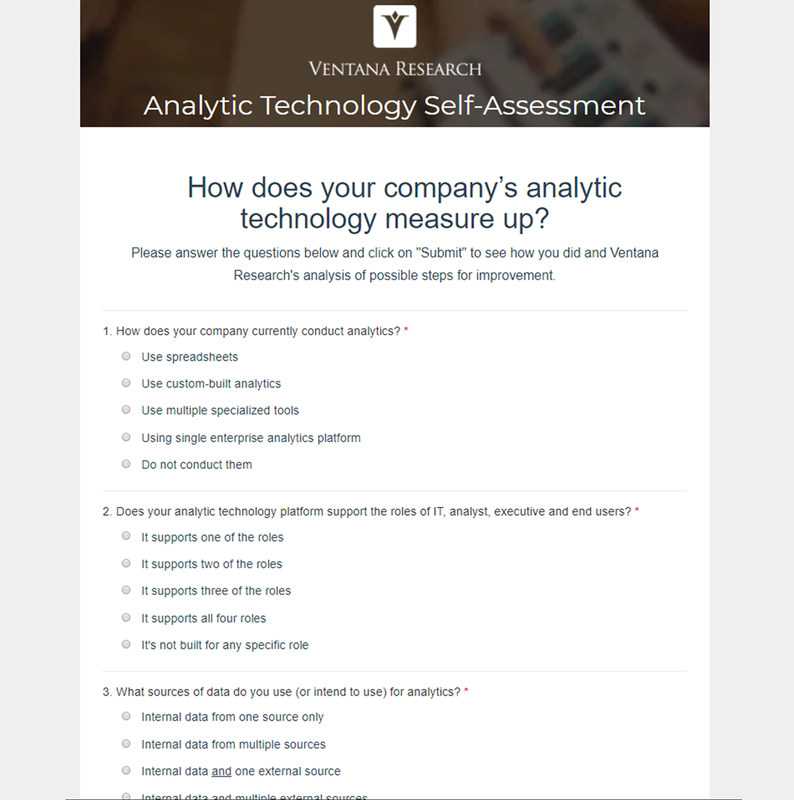 The Ventana Research Self-Assessment is a survey-based piece that provides custom-tailored feedback to those that take the assessment, all based in our research and insights drawn from our benchmark research, and from the subject matter experience of our analysts. Using our insights, we design an 8-to-10 question survey covering a specific business and/or technology topic that readers are exploring. It is designed to provide next-steps users need to take to improve their business, along with a direct route to that next step. We work with you to create a Self-Assessment specific to your needs and goals. We do the heavy lifting to create a Self-Assessment on a mutually agreed upon topic that engages your audience using our expertise and only our own market facts. Your organization will have exclusive distribution rights to the Self-Assessment we create during the licensed period. Interested in learning more? See an example below and reach out to our team to see exactly how we can help elevate your marketing and sales efforts. How does your company’s analytic technology measure up? Answer the questions, click on "Submit", and see how you did, along with Ventana Research's analysis of possible steps for improvement. How does your company’s sales analytics measure up? Answer the questions, click on "Submit", and see how you did, along with Ventana Research's analysis of possible steps for improvement. How well does your Office of Finance handle the close? Answer the questions, click on "Submit", and see how you did, along with Ventana Research's analysis of possible steps for improvement. Fill out the form below, and a member of our Client Services team will reach out shortly.